The good news? We’re one more Boston victory away from an improbable Celtics-Lakers matchup in the NBA Finals that, under normal circumstances, would have me so giddy I’d be walking around Los Angeles randomly re-enacting the McHale-Rambis clothesline on unsuspecting pedestrians. The bad news? Nobody is beating the Lakers this season. Not Boston, not Detroit, not anybody. They have the best team, the best player and a Hall of Fame coach. It’s really that simple. Now here’s where you shake your head and say, “You’re just trying to do another reverse jinx like that column about how Kevin Garnett isn’t clutch.” Fair point. That column was written for two reasons — because I thought it was an interesting debate (is clutchness in our DNA or do we acquire it through repetition? ), and because I was aiming for a reverse jinx that partially absolved me for blowing an undefeated Patriots season four months ago. This is different. The Lakers clearly have a better team. I believed this to be true before the playoffs and haven’t seen anything to change my mind; if anything, the first three rounds confirmed the chasm between the two teams was even larger than anyone believed. Even with home-court advantage in the Finals, the Celtics will still be underdogs against the Lakers. And they should be. I attended Game 5 of the Pistons-Celtics series and Game 5 of the Spurs-Lakers series within 24 hours of each other, on separate coasts, just to get a feel for what a potential Boston-L.A. Finals could be like. Game 5 invariably ends up being the most competitive game of any good series because the teams learn how to beat one another over the first four games, so that fifth game comes down to execution, energy and desire. In a deadlocked series, Game 5 becomes crucial for obvious reasons. If somebody is leading 3-1, you find out everything you need to know about the leading team (is the squad tough enough to close out the series?) and the trailing team (how will it respond in a do-or-die situation?). And if there’s any smoldering snippiness waiting to be unleashed, it usually happens in a Game 5. Remember when Bill Laimbeer’s face attacked Robert Parish’s fists in 1987? These are the things that happen in fifth games. As the Scripps National Spelling Bee reaches its conclusion Friday night (8 ET, ABC), look back at Bill Simmons’ famed running diary of the 2002 bee. Unlike the do-or-die seventh game, which usually becomes more of a life experience than a sporting event, Game 5 doesn’t provoke the same level of nervousness with players and fans. More times than not, it’s the game in which two good teams bring the best out of each other. Turn on ESPN Classic or NBA-TV during a playoff marathon and you’ll notice an astonishing percentage of Game 5s filling the schedule: Boston-Phoenix (’76), Chicago-Utah (’97), Chicago-New York (’93 and ’94), Boston-L.A. (’84), Indy-New York (’94), Boston-Detroit (’87), San Antonio-Detroit (’05), New York-L.A. (’70), Houston-Phoenix (’94), Utah-Los Angeles (’88), Detroit-Boston (’85), Philly-Boston (’81), Miami-Dallas (’06), Philly-Milwaukee (’01), Detroit-Portland (’90), Chicago-L.A. (’91). … I mean, even when they had to split-screen the ’94 Finals to keep up with O.J. Simpson’s car chase, it happened during a Game 5. So that’s why I made the cross-country voyage and back. The Pistons-Celtics game started at 8:35 ET on Wednesday night, giving Boston fans plenty of time to get tense about things like “I wonder if KG will show up tonight?” and “I wonder if Doc will throw Sam Cassell’s dead body out there again?” After six yo-yo weeks in the playoffs, nobody knows what to make of the Celtics anymore. They play hard, they’re poorly coached, and they live and die by jump shots. That’s really all we know. During the first 60 games of the regular season — you know, before Doc Rivers completely panicked, strayed from his set rotation and openly tried to defy every example of how to coach a successful playoff team — the Celtics were getting a nightly boost from their bench guys, specifically James Posey, Eddie House, Leon Powe and Glen Davis. Then Cassell and P.J. Brown were added to the mix, and just like everyone secretly feared, Doc couldn’t settle on a nine-man rotation heading into the postseason, ultimately deciding to “coach by feel,” as his former broadcast partner, Mike Breen, justified it during one of the Eastern Conference finals games. Well, here’s what happens when you “coach by feel”: Your bench guys lose confidence. Guys start looking over their shoulders. There’s no consistency from game to game. And fans who haven’t bought cigarettes for five years — namely, me — end up driving to a seedy liquor store at 10 o’clock at night for a pack of Marlboro Lights. (Thanks, Doc — not only are you going to blow the 17th title, but you just increased my chances for lung cancer. Fantastic.) Of course, you can’t blame the coach for Ray Allen turning into Tony from “Blue Chips” for five weeks, or for those inexplicable games when Garnett seems terrified to shoot or do anything that would make you think he makes $23 million a year. But what’s particularly strange about this Celtics team is, for all the absurd hype about “The Big 3,” nobody knows whether the “Big 3” are showing up from playoff game to playoff game. Garnett was the best player on the court in Games 1 and 3 of the Detroit series; in Game 4, he played like a rookie. Pierce played one of the better playoff games in franchise history in Game 7 against Cleveland; in the Detroit series, we haven’t really heard from him. And Allen has been so atrocious that the home crowd gets extra excited every time he shoots a jumper, to the point that it’s a little embarrassing. As reader Sals in Toronto described it, “Is Ray Allen THAT bad now? Watching the Boston crowd rally behind him after a 12-footer is like watching the Jason McElwain story all over again.” Ouch. But it’s true. It has been a grueling six weeks for anyone who cares about the Celtics and spent the regular season following them and dreaming about a title. During the demoralizing and impossibly frustrating Atlanta series, we realized the team wasn’t nearly as good as we thought. During the Cleveland series, we braced ourselves for a playoff collapse that never came. Heading into the Detroit series, we talked ourselves back into a potential 17th banner based solely on the “we have homecourt and nobody can beat us in the new Garden” theory, keeping our collective guard up the entire time. Then Detroit won Game 2 in Boston, and just when we were about to check out, the Celtics played their best game of the playoffs and ran away with Game 3 in Detroit, and just when we were checking back in, they fumbled away Game 4 even though Billups and Prince sucked and even though the referees were giving them every call. By Game 5, we were a collective emotional wreck. You could feel it in the stands. Everyone I talked with before the game seemed to say one of four things: I can’t figure us out anymore. … I wish we knew who was showing up. … I have no feel for this series anymore. … I’m going to need a vacation after the playoffs. … Grady Little and the Boston Red Sox. That was the last time we went down this road with a talented Boston team, and if you remember, the guy driving the bandwagon ended up careening it into the highway divider. You don’t have to be a genius to figure out the Grady/Doc parallels here; let’s just say Grady did things by feel, too. But that’s the great thing about Boston fans — we see the warning signs, we recognize them, we admit them, and then we blindly plow ahead anyway. By the time Game 5 tipped off, everyone had talked themselves into a gutty Boston victory. It turned out to be a spectacular game — intense, dramatic, reasonably well-played and genuinely goofy for a couple of reasons. First, Kendrick Perkins played out of his mind in the first half and looked like a young Moses Malone. (Note: If there’s an X-factor with this particular Celtics team, it’s the number of Aberration Guys on the team. An “Aberration Guy” is defined as “someone capable of playing out of his f—— mind for one game or even one half.” Rondo carried the Celts in Game 5 of the Cleveland series. P.J. Brown was the best player on the court in the last six minutes of Game 7 against Cleveland. You get the idea.) Second, Ray Allen improbably found his mojo and turned into a certified bomber again; not only was it like seeing someone come back from the dead, but every shot electrified the crowd to the point that you would have thought some female fan was flashing her breasts on the Jumbotron. And third, Doc finally realized the television timeouts during the playoffs are so interminably long there’s no real reason to “rest” your starters, so he finally — FINALLY!!!! — played Rondo, Garnett and Pierce big minutes. If Game 5 had been a normally timed game, the Celtics would have blown out Detroit and that would have been that. But the game took so freaking long to play (thanks to the timeouts and too many whistles from Mike Callahan, who’s the next Joey Crawford in that he mistakenly thinks the fans showed up to watch him call fouls), and the Celtics and their fans expended so much energy during the first three quarters that when Detroit finally made its run in the fourth quarter, it felt like we were already playing Game 6. The Pistons kept inching closer and closer, buoyed by full-court pressure that Flip Saunders (no brain surgeon himself) should have been using for this entire series because Boston is such a shaky ballhandling team. We yelped and hollered and cheered and stood for most of the fourth quarter, but we couldn’t stop what was happening — the Pistons wouldn’t go away, and unlike the Lakers, Boston doesn’t have that stake-in-the-heart scorer who can stop an opponent in its tracks when it’s making a run. Twenty-four hours later, the mood was a little different in sunny Los Angeles. The Lakers fans were supremely confident, and rightly so — the Lakers had a better team, they had the best player and, if that’s not enough, the refs handed them Game 4 by not giving Brent Barry a call that Kobe would have gotten 100 times out of 100. Whatever. Unlike the Boston fans, the Lakers’ faithful fully expected to win and you could feel it throughout the game, even in the second quarter when L.A. trailed by 17 and the fans patiently waited for their team to make a run. When the comeback finally came, nobody was surprised. When Kobe took over the game in the fourth quarter and dipped into MJ’s patented “Not Only Am I Going To Beat You, I’m Going To Rip Your Hearts Out ‘Temple of Doom Style'” territory, nobody was surprised. It’s a likable, entertaining, reliable team with a transcendent player in his prime, and any time you have that combination in place, you’re going to win the title. You just are. Just the difference between the two crowds was telling. The Boston crowd stayed on top of Game 5 from the first second, standing and cheering, hollering for calls, exhorting the Celtics and doing everything possible for an edge. We didn’t let up for one second over the span of three-plus hours — mainly because we couldn’t — and even the game presentation was structured around keeping us engaged and alive. We were treated to the obligatory “In my book, we’re gonna be winners!” speech from “Hoosiers,” the obligatory “Predator” montage and the obligatory Pacino speech from “Any Given Sunday.” During one timeout, they showed a montage of celebratory images from Super Bowl XXXIX, followed by live shots of Tedy Bruschi (downright giddy) and Bill Belichick (grinning proudly) in the stands. Coming out of other timeouts, they ran clips of Garnett, “Big Baby” Davis and Laurence Maroney urging the fans to keep their energy up. Everything was geared around winning the game and keeping the fans involved. The Lakers fans? They treated it like any other game, mainly because they could — again, the Lakers have the best team. Because of the early start time, the fans didn’t even fill the arena until midway through the second quarter. They ran a “Kiss Cam” during one timeout and had a fan attempt a half-court shot during another. You wouldn’t have even known it was the playoffs except for the competitiveness of the game (way up there) and a spectacular “Hollywood Nights” montage of celebs that featured Tobey Maguire, Cameron Diaz, Flea and others, ending as always with a semi-disoriented Jack Nicholson standing up and applauding like a homeless person. I will say this much: The Lakers have surprisingly good fans, better than I ever expected. They know when to cheer, they know how to affect games and they’re definitely not Jumbotron Robots like four-fifths of the fan bases in the league. My theory here is simple: With almost every NBA team, the real fans have been priced out, replaced by pseudo-fans who have no idea what to do and how to act, and they don’t really care, anyway. This never happened in Los Angeles because the tickets were always expensive and the fans were too rich to be priced out; hence, either the same people are coming to these games that caught Showtime in the ’80s, or it’s the children of those people. Regardless, it’s a lively, knowledgable crowd that loves Kobe more than any other NBA city loves its signature player. I can say that with complete confidence. They love him. For years and years, they stood by him, defended him, made excuses for him and kept cheering him, and now he’s nearly finished vindicating the entire rollercoaster ride of an experience for them. There was one moment near the end of Game 5, well after Kobe had taken over, when the fans could sense it, and so could the Spurs, only he hadn’t totally euthanized them yet. Leading by five and killing precious seconds near the midcourt line, everyone waited for him to make a move, all of us standing, all of us fully aware that something special would happen. Pau Gasol ambled over to set a screen, only Tim Duncan didn’t even bother to go with him, knowing Kobe would drive to the hoop … which he did. Even with Duncan (only one of the best defensive players ever) planted directly between him and the basket, Kobe dribbled left, put on an extra burst of speed and somehow got to the rim for the clinching layup even with Duncan anticipating every step of the play. When the ball fell through, you could see the life sink from Duncan’s body, and from everyone else on the Spurs for that matter. They weren’t beating Kobe. Not this year. I hate comparing anyone to Jordan, but what Kobe has shown over the past four months has been Jordanesque — not just his ability to raise his game in big moments (which he always had), but the way he can pick his spots, keep his teammates involved and then just arbitrarily take over the game and put it away. If being an NBA superstar was like playing “Grand Theft Auto,” then that would be the final mission, right? The way Kobe singlehandedly assassinated the Spurs in Games 1 and 5 was something we’ve only seen from a handful of players in NBA history. You can’t say enough about it. He has become the player we always wanted him to be. And honestly, it’s one of the biggest reasons why I love basketball so much. Of all the team sports, it’s the only one in which a single player can impose his will on a game, a series or even in some cases, an entire season. Kobe was the most gifted player in the league for most of this decade, but for whatever reason, he couldn’t figure out how to put everything together until this year. Maybe he matured, maybe he grew up, maybe Chris Wallace just needed to gift-wrap the best young center in the league for him. Regardless, he’s the best right now, and what’s truly scary is that next year’s Lakers team will be even better. 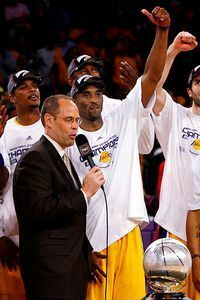 But that’s what stood out more than anything about the second Game 5: the complete confidence that every Lakers fan had in Kobe compared to the lack of confidence every Celtics fan had in Boston. The Lakers are in the driver’s seat right now. And when the L.A. fans chanted “We want Boston! We want Boston!” at the tail end of Game 5, normally the moment would have sent chills down my spine. This time around, it just sent chills. We might be headed for another Celtics-Lakers Finals, but I don’t think I’m going to enjoy the result all that much.